Google Docs has gone native for Android, giving users a bunch of features that aren't available through the Web browser. 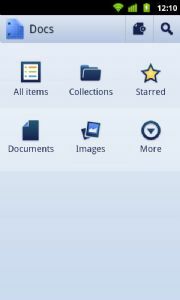 The app, available for free through the Android Market, provides a slick interface for accessing documents and spreadsheets. The editor itself however is still handled through the browser. Widget: The Google Docs home screen widget lets users jump to starred documents, create new documents or snap a photo to upload. 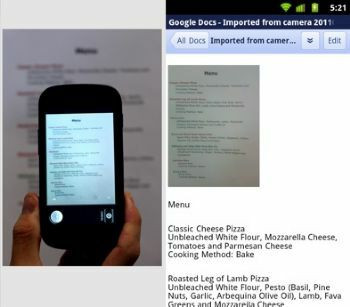 Photo-to-text scanning: The Google Docs app can use optical character recognition to turn new or existing photos into documents. Sounds neat, but it won't recognize handwriting or some fonts. Share with contacts: The native app can tap into an Android phone's contact list to share documents. Unfortunately, there doesn't seem to be offline support at the moment. A user in Google's forums did notice that the app includes a cache of up to 20 MB, and there's a "Sync Docs" option under the "Accounts & Sync" setting, but the only thing that appears offline is a list of documents. Maybe offline support will be added in the future, but since the editor is still handled through the browser, I don't see this happening anytime soon. Google Docs is available now for Android versions 2.1 and higher.